Sample invitation acceptance letter as chief guest, guest of honor or as individual participant. You can use this letter for accepting any party/ceremony invitation like opening ceremony, closing ceremony, annual day, conference or any other event of your choice. 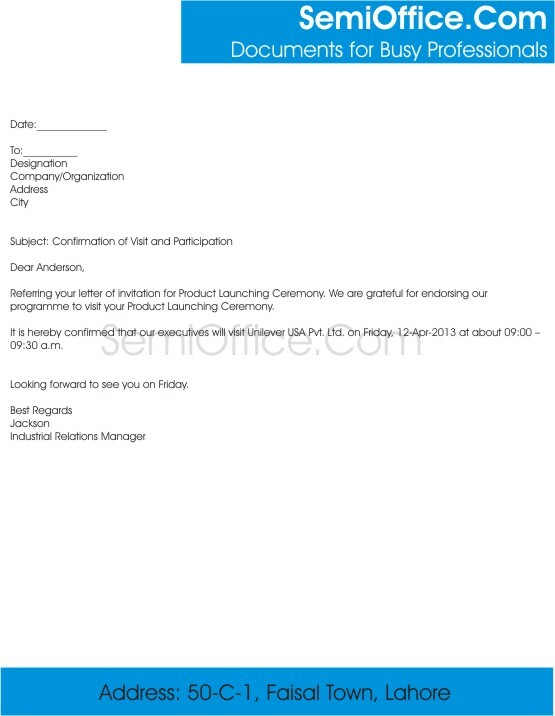 Referring your letter of invitation for Product Launching Ceremony. We are grateful for endorsing our programme to visit your Product Launching Ceremony. It is hereby confirmed that our executives will visit Unilever USA Pvt. Ltd. on Friday, 12-Apr-2013 at about 09:00 – 09:30 a.m. Looking forward to see you on Friday. We appreciate your initiative of internship program for students of LUMS. AH Foundation is already receiving interns from LUMS. We will warmly welcome internees from ASP-LUMS and our representatives from our marketing department will attend the job fair to introduce AH Foundation to young students of LUMS. Our staff members have attended many training programs of ASP-LUMS. We would like to send our staff members, Mrs. Mamoona & Ms. Javeria for further training. It is a great pleasure to accept your invitation on your prize distribution ceremony. I have always respected your efforts to enhance the skills and development of students. It will be an honor for me as well to hand over the prizes and certificates to qualifying students. I have a free schedule during the event. Therefore I will ensure my presence. I want a sample letter to accept a job offer.